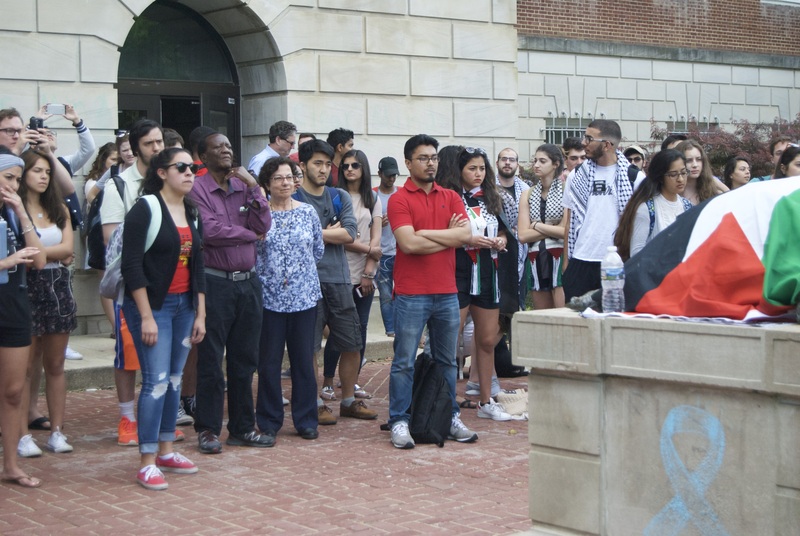 Rock climbing, camel rides and food were all a part of the festivities on McKeldin Mall for Israel Fest Tuesday, but another notable attraction was the boycott of the festival held by numerous on-campus organizations. 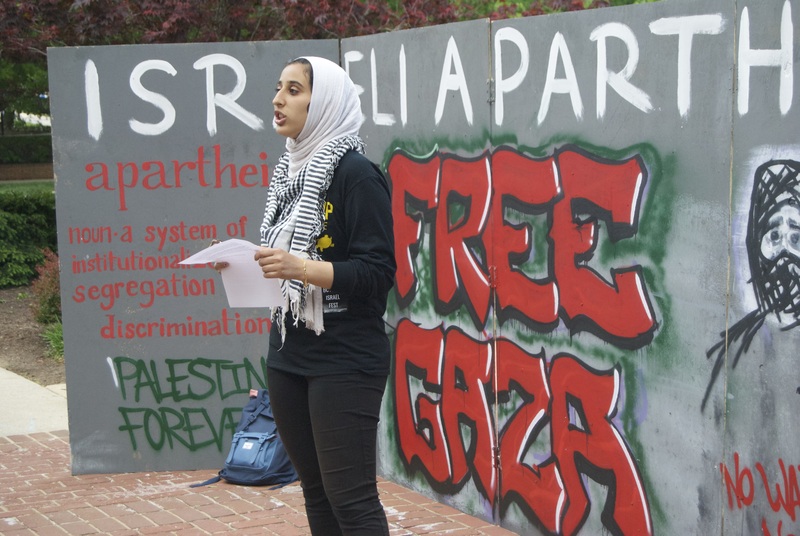 This university’s Muslim Political Alliance and Students for Justice in Palestine, which had a notable presence at the event, were among the groups hosting the boycott. Members of these organizations gave speeches intended to educate students on the Israel-Palestine conflict. People gather for a boycott of Israel Fest in front of McKeldin Library May 2. Jared Beinart/Mitzpeh. Last year at Israel Fest, members from SJP and other pro-Palestine on-campus organizations protested the event with megaphones and signs. This year, the organizers focused on teaching and educating onlookers about the on-going Israel-Palestine conflict. MPA President Sarah Eshera said she hoped to educate students regarding Israel’s oppressive nature towards many different religions and groups affected by the conflict. MPA President Sarah Eshera speaks to boycott attendees. Jared Beinart/Mitzpeh. Shane James, a senior history major and SJP member, explained his focus to promote the effort of peace and justice for Israelis and Palestinians. Along with educating students, SJP is focusing its attention towards a Boycott, Divestment, Sanctions movement which is modeled after the anti-Apartheid movement in South Africa. 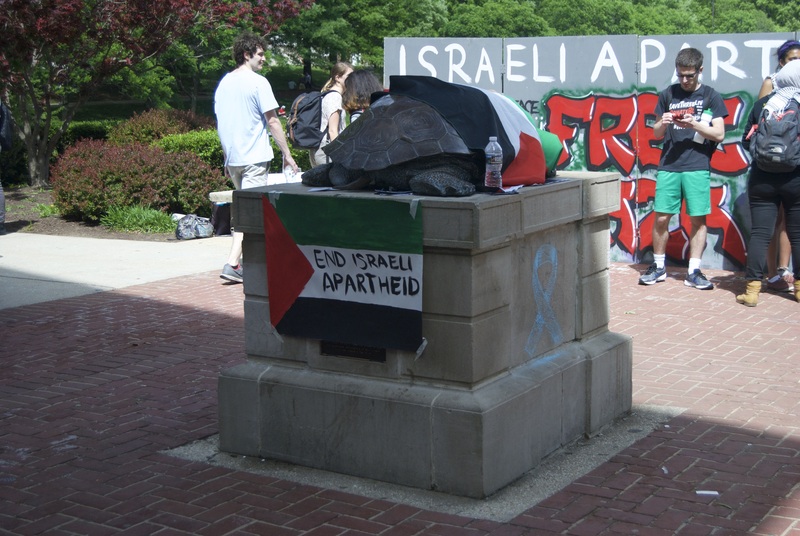 Testudo dressed in a Palestinian flag and a sign that reads “End Israel Apartheid” during the boycott. Jared Beinart/Mitzpeh. Jewish Student Union president Sam Fishman, a senior government and politics major, said though he does not agree with the protest, he is pleased with how the event was handled. “Unlike last year, they did not interfere whatsoever with our event. That’s how it should be done,” Fishman said. JSU is responsible for organizing the annual Israel Fest, which it plans as a festival to celebrate the history and culture of Israel. The event is intended to welcome students from all over campus to enjoy the festivities. “Israel Fest welcomes many organizations all across the political, social, and cultural spectrums,” Fishman said. No Replies to "Pro-Palestine groups lead boycott of Israel Fest"